These studies were conducted in a computer lab and a small office at Washington State University. Interior plants, when present, were placed around the sides of the room for a one-week period. Relative humidity and particulate matter were monitored. Particulate matter was measured around the rooms on various surfaces away from the plants. Dust was significantly lower throughout both rooms when plants were present than when they were absent. Dust was reduced by as much as 20% with plants. This study confirmed that the use of plants to remove particulate matter, which has often been used outdoors to control deposition, also is effective on the scale present in interiors. Clearly, water will transpire from plants that are added to a room. What was not clear before this study, was whether the amount of transpired water was sufficient to make a significant or meaningful contribution to the overall humidity in the room. Some even speculated that the increase might be so great that moisture damage could result. When plants were absent from the rooms used in this study, the relative humidity was very low, and often below the range of 30% to 60% recommended for human health and comfort. When plants were added, the relative humidity rose significantly, but not excessively: in one case, for example, relative humidity without plants averaged 25%, and with plants it averaged 30%. The following articles discuss the results of this research. This article presents data from measurements of dust and relative humidity in both rooms. This study was partially supported by the American Floral Endowment and the Horticultural Research Institute. 2. Lohr, V.I. 1992. 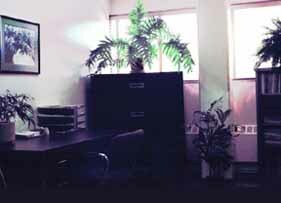 The contribution of interior plants to relative humidity in an office, p. 117-119. In: Diane Relf (ed.). The Role of Horticulture in Human Well-being and Social Development. Timber Press, Portland, OR. This article presents the results of the first experiment in the office. In addition to presenting relative humidity data, the article discusses the impacts of relative humidity on human health and well-being. 3. Lohr, V. I. 1992. Research on human issues in horticulture motivates students to learn science. HortTechnology 2:257-259. This article includes the results of one experiment that measured relative humidity in the computer lab. The article primarily discusses the use of independent research projects with undergraduate students.